An oil industry task force has identified storage capacity as a key missing link in ensuring the country’s long term energy security particularly now with the planned conversion of the Kenyan refinery into a merchant facility which buys and refines products for sale. Oil dealers will in future be compelled to invest in storage tanks as part of new requirements for licensing, raising the bar for entry into the capital intensive industry. An industry task force has identified storage capacity as a key missing link in ensuring the country’s long term energy security particularly now with the planned conversion of the Kenyan refinery into a merchant facility which buys and refines products for sale. The refinery has since its establishment been running on a contract manufacturing model, where it refined products for a fee on behalf of other marketers. “Independents can undertake such investments jointly. Two or more firms could join to develop one storage facility,” says the report by the task force that was appointed by Prime Minister Raila Odinga. The task force was chaired by Silvester Kasuku and its report - Petroleum Industry in Kenya - released last month. It also proposes that the government constructs new storage facilities at Mtito Andei, Taveta, Konza and Nanyuki to ease distribution of oil. Also proposed is expansion of storage capacity in of Mombasa, Nakuru, Kisumu and Eldoret. There are 53 oil companies in Kenya, many of them single outlet operations that rely on tankers to replenish their stocks. The refinery boasts more than half a million cubic metres of storage space whose availability to marketers will be restricted once it changes its business model. “The biggest risk regarding refinery storage is if it gets withdrawn from the market completely during the upgrade, which would mean we need more storage for imports, and this would be urgent,” said industry consultant Mwendia Nyaga. Currently, the refinery allows dealers without own network to keep their products at a fee of a $3 (about Sh270) per cubic metre per month. Big firms with a network of storage tanks mainly in Mombasa and Nairobi charge $6 per cubic metre for the same duration. The refinery’s storage charge is likely to be reviewed in January when market rates start defining the cleaner’s pricing. The scarcity of storage space amid surging demand is likely to push prices upwards. “Only Nock and Gulf Energy have recently built plants but they are small,” said Peter Nduru, director for petroleum at the Energy Regulatory Commission (ERC). Gulf Energy’s terminal however is a truck loading facility that will rely on the Kenya Pipeline storage in Embakasi. The Gulf depot has an installed capacity of 3 million litres plus 400 000 tonnes of while State-owned Nock’s Nairobi terminal has a capacity of 3.7 million litres per day. Google recently revealed that their data centers and operations around the world consume a whopping 260 million watts, or roughly the equivalent of 200,000 homes in the United States. While that’s an enormous amount of electricity, it pales in comparison to the amount that Google wants to create from investments in renewable resources: 1.7 gigawatts. More than enough to impress Doc Brown. Yet neither Google’s massive hunger for power, nor their dedication to green energy may ultimately be as impacting as their third claim: that Google products are the most cost efficient and environmentally friendly choices for businesses. Does going green mean going Google? One thing is for certain: as the titan of search continues its phenomenal growth, they reveal that their strategy is just as ambitious as their scope. That Google consumes as much electricity as 200,000 households is very impressive, and it gives you a sense of how truly enormous this company has become in the past decade. The New York Times (who originally reported the 260 megawatts figure) puts that power in perspective by stating that it is roughly equivalent to 1/4 of a nuclear power plant, though I would have said 1/2 of a typical coal burning plant. In any case, the message is clear: Google is consuming electricity on the level of a (not so) small nation. The big numbers about electricity and the focus on renewable energy, however are hiding the quiet but potentially industry shifting claim that Google exceeds all expectations with their efficiency. At the individual consumer level (which is forefront on Google Green) Google tell us that providing a user with a month of Google products requires about as much energy as running a 60 watt light bulb for three hours (180 watt-hours). In case you don’t use old incandescent bulbs anymore, The Big Picture gives you plenty of other comparisons: a year of Gmail is equivalent to making one bottle of wine, 3 days of YouTube requires as much energy as to make just one DVD,etc. Dig deeper and you’ll find this amazing report, which describes how cloud-based products, like those offered by Google, represent an enormous increase in efficiency compared to in-house server solutions. 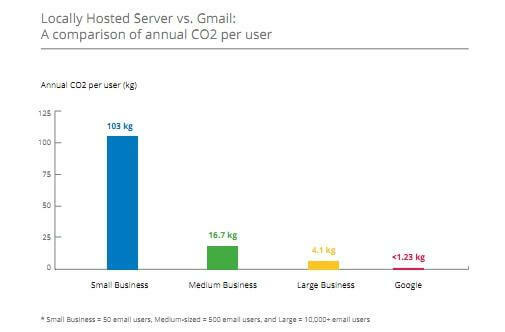 In some cases, Google claims that Gmail is 80 times more efficient than traditional systems. 80 times! 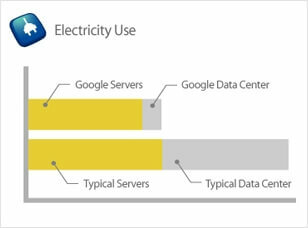 Even against their data center competitors, Google claims to be twice as efficient. Not only that, but they compound their efficiency with their renewable energy habits to show that the carbon footprint of their services is a small fraction compared to other solutions. Which is a very powerful message. In the ongoing efforts to “go green” businesses are pursuing a variety of changes to improve their carbon emissions and their public image. Environmental consideration is big business. Google has essentially pulled that business into their laps. Why spend millions on innovating your electronic services when you can just switch to Google products? Products which, at least on a small business level, are essentially free. Yeah. I know what I did. I use Google products all the freakin’ time. Looking forward, it seems clear to me that Google plans on being the best at what they do at every level of their business. 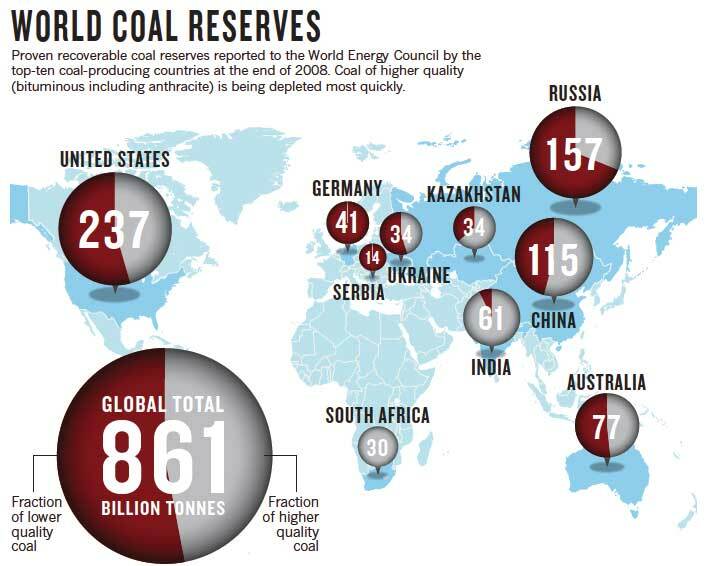 Google is not only investing in new energy resources, it has secured the rights to buy and trade energy as well. They not only are pushing for greater efficiency, they are trying to attract more users with that efficiency…which will help them further increase their efficiency. They are collaborating with other groups with similar goals in energy to form networks that raise the bar and enable new technologies in the field. You can look at Google’s impressive energy consumption numbers and say, “wow, these guys are huge” or you can look at their strategy and realize, “my God, they are going to get astronomically larger”. Bottom line, Google wouldn’t have made a big deal of announcing these numbers if they didn’t have a lot to gain from their release. A green mentality, great efficiency, and gigawatts of future energy all add up to one thing: Google’s growth is going to be irresistible. Scientists have been working to achieve self-sustaining nuclear fusion and energy gain in the laboratory for more than half a century. Ignition experiments at the National Ignition Facility (NIF) at Lawrence Livermore National Laboratory (LLNL) are now bringing that long-sought goal much closer to realization. NIF's 192 giant lasers, housed in a ten-story building the size of three football fields, will deliver at least 60 times more energy than any previous laser system. NIF will focus more than one million joules of ultraviolet laser energy on a tiny target in the center of its target chamber—creating conditions similar to those that exist only in the cores of stars and giant planets and inside a nuclear weapon. The resulting fusion reaction will release many times more energy than the laser energy required to initiate the reaction. Experiments conducted on NIF will make significant contributions to national and global security, could lead to practical fusion energy, and will help the nation maintain its leadership in basic science and technology. The project is a national collaboration among government, academia, and many industrial partners throughout the nation. Programs in the NIF & Photon Science Directorate draw extensively on expertise from across LLNL, including the Physical and Life Sciences, Engineering,Computation, and Weapons and Complex Integration directorates. This goal is a scientific Grand Challenge that only a national laboratory such as Lawrence Livermore can accomplish. Peel Energy has been granted consent for a revised application to build a biomass energy plant at Ince Marshes in Cheshire. The proposed plant will be capable of producing 20MW of electricity as well as heat and steam. It will use around 175,000 tonnes of waste wood each year. The original consent was for a plant to produce bio-ethanol, an industrial alcohol produced by fermentation. Changes to regulation affected the market and made the scheme unviable, Peel said. Jon Burley of Peel Energy said: "We would like to thank the council for giving the plans a fair hearing. We realise that applications like these are not easy. However, these are exactly the kind of decisions that are required if the UK is to meet its renewable energy targets and avoid valuable resources going into landfill. "We are very pleased with the outcome and look forward to taking the project on to the next stage, ultimately delivering renewable energy and jobs for the region. We are also keen to continue our dialogue with community groups via the Ince Park Community Forum as we have done throughout the application process." The two-year construction of the plant could begin in 2012 meaning that the plant would be making a substantial contribution to regional targets by 2014. The plant would sit next to another energy-from-waste plant at Ince Marshes planned by Peel in a joint venture with US firm Covanta, with a 95MW capacity. Solar companies Solyndra of California, Evergreen Solar Inc. of Massachusetts, and SpectraWatt of New York have all filed bankruptcy petitions and face drastic restructuring if not liquidation. “There is a crisis in the solar manufacturing world…no question about it,” recently stated Ken Zweibel, director of the Solar Institute at George Washington University.The crisis transcends the companies in question. The underlying reality is that solar power is radically uneconomical against conventional electricity generation on the grid. Thus special government favor for short-term profits sets up the industry for longer-term failure when the subsidies dry up—or if other countries bait the same perilous hook and beat us at our own political game. We should know that solar is not competitive by a long shot. As DOE secretary Chu told the New York Times last year, solar technology would have to improve five-fold to find its own way in the competitive world. Mixed solar/conventional installations could become the most economical alternative in most parts of the UnitedStates within the next few years. I think frankly, the—the consensus as far as I can see is after the year 2000, somewhere between 10 and 20 percent of our energy could come from solar technologies, quite easily. In future decades, [photovoltaic technologies] may become standard equipment on new buildings, using the sunlight streaming through windows to generate electricity. Back in 1994, the New York Times excitedly reported that solar’s competitive moment had arrived thanks to Solarex, the second largest U.S. manufacturer of photovoltaic cells, operated and half-owned by Enron. The feature, complete with a photo of an Enron executive holding a panel up in a sunny sky, concerned a project in the southern Nevada desert that would be the largest in the country, generating enough electricity from sunlight to power the equivalent of a city of 100,000 people. It was expected to begin operating by year-end 1996. A business-section feature in the New York Times, “Solar Power, for Earthly Prices: Enron Plans to Make the Sun Affordable,” reported Enron’s pledge to deliver power for $0.055 per kilowatt hour from a 100 megawatt solar farm in the Nevada desert within two years, comparable to the average cost of delivered electricity across the nation. Enron’s rate was unheard of, exceeding even the most optimistic estimates from environmental pressure groups. But it was highly contrived, depending on a raft of government subsidies, as well as questionable assumptions about financing, technology, and delivery schedules. The rate was also back-loaded, with compounded annual cost escalations for thirty years. Still, the article described the enticing profit prospects of Enron’s advances. Two officials from the Clinton Administration’s Department of Energy were quoted. “This establishes the benchmark we want and restarts a stalled solar industry,” said the head of DOE’s photovoltaic section. Deputy Secretary William White (aka Bill White, one of Enron’s last defenders [and later Houston’s mayor from 2004 through 2009]) stated his intention to try to help make the economics of the project work. But the smoke-and-mirrors project was too much for the Clinton Administration—and even for Enron, despite a suite of special subsidies. It languished and quietly died. Nevertheless, it was a heady PR moment for a politically correct company and a credulous press that either did not know or did not report the whole story. Don’t expect false hopes to disappear. The European solar lobby is now predictingthat solar will be cost competitive by 2020. But the failed past of solar informs the present, and Obama’s new push for “green” energy should be judged accordingly. Although stand-alone solar power has a certain free-market niche and does not need government favor, using solar power for grid electricity has been and will be an economic loser for ratepayers and a burden to taxpayers. Heinberg is the author of nine books, includingBlackout: Coal, Climate, and the Last Energy Crisis, The Party’s Over, Peak Everything, and the soon-to-be-released The End of Growth. He is widely regarded as one of the world’s most effective communicators of the urgent need to transition away from fossil fuels. David Fridley: Since 1995, David Fridley has been a staff scientist at the Energy Analysis Program at the Lawrence Berkeley National Laboratory in California. He is also deputy group leader of Lawrence Berkeley's China Energy Group, which collaborates with China on end-user energy efficiency, government energy management programs, and energy policy research. Mr. Fridley has nearly 30 years of experience working and living in China in the energy sector, and is a fluent Mandarin speaker. He spent 12 years working in the petroleum industry both as a consultant on downstream oil markets in the Asia-Pacific region and as business development manager for Caltex China. He has written and spoken extensively on the energy and ecological limits of biofuels. This article was Originally published November 18, 2010 in Nature Vol 468. Republished with permission.